Needed to do some procrastination, so I figured I could write a few lines about a sweet burn deck. Direct damage is is a valid, and not insanely expensive, approach to Old School magic. With both Lightning Bolt and Chain Lightning legal, players have access to two of the best burn spells ever printed. The restriction is mainly that the future great red creatures, like Jackal Pup and Wildfire Emissary, are still many years away. One approach is to go the road of Electric Eel Aggro, adding blue to the deck to get access to aggressive creatures like Serendib Efreet and Electric Eel. This also gives the player access to Psionic Blast and Energy Flux. Another approach is to add green, for an Erhnam Burn'em deck, with a higher overall curve, but access to Kird Apes and the Channel/Fireball combo. 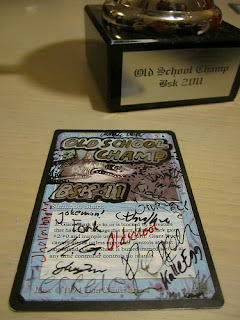 About a year ago, Fab Sanglard from Toronto hosted the first old school tournament overseas. Now, another city in Canada has started a vibrant 93/94 community, spearheaded by Mike Borgardius in Nova Scotia. 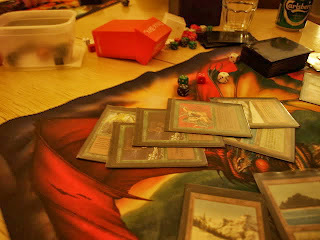 Last week they held a 4-person tournament, battling out for a booster of Revised. The Nova Scotia crew allow Revised as an 8th set in their tournaments; it's a way for people to somewhat easier get into the format, and it was after all released before both Legends and The Dark. 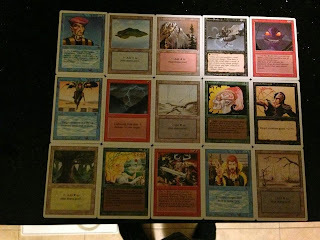 The winner got a few pack-fresh staples for his deck and, as is customary in old core set boosters, a lot of basic lands. Mike's deck is a sweet version of The Deck, optimized against creature heavy decks (e.g. maindeck Moats instead of Scepters). 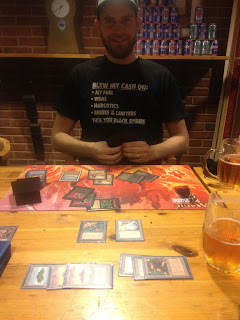 Last Saturday I got to play some Magic at the old Rotary Pub again. I don't think I've had the chance to play since I had my Oslo showdown at the central station about a month ago, and playing at Rotary has become even more rare. Good times were had in the closed pub, with trash talk and beer aplenty. I played a few games against Freespace's awesome new deck. At one point I really though I had the game locked, after some sweeping I had stabilzed around 15 with a Forcefield in play, and tapped out for a Mirror Universe. You should never underestimate a single Juzam on the board though. Anyway, I was thinking about Berserk, and new tech, and my mind wandered to one of the original Berserk-abusing decks from the way-back time. This deck was played in the World Championships 1994, back when Berserk where restricted as "failure to have a fog should not warrant 80 damage". This deck is still very good with only a one-off Berserk. A creature with protection from one or more colors of magic cannot be affected by any magic of those colors. 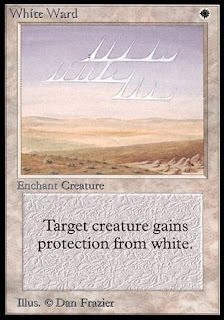 For example, a creature with protection from blue cannot be blocked by blue creatures, dealt damage by blue creatures, or enchanted, damaged, or otherwise affected by blue cards. There's yet something akin to summer in the Nordic countries, so the spirit is still high up here. Finding some of the last decklists required some digging btw, but I think they are all correct.